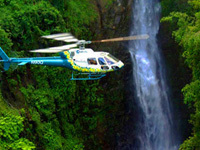 Fly high on our Maui Heavenly Hana and Volcano Helicopter Tour. On this tour you will experience an incredible birds eye view of sparkling waterfalls, the beautiful colors of Hana's Rainforest and ascend the slopes of the massive Mt Haleakala Volcano. 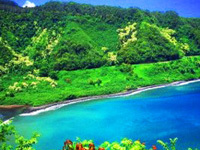 Hana's Rainforest is located on the North Shore and extends over 180 square miles. From the air, you will see Hana and her unique beauty in a way not possible from the ground. The Hana Rainforest is lush and tropical. The vibrant greens of the rainforest and stunning turquoise blues of the water are shockingly beautiful. This tour allows you a chance to capture some unbelievable photos of Maui on this breath-taking helicopter flight. As you continue along Maui's coastline, you will have an opportunity to view hundreds of spectacular, sparkling waterfalls that can only be viewed by helicopter. 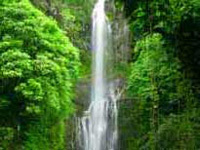 Maui's most beautiful waterfalls are so remote and secluded that it is impossible for ground tours to gain access. 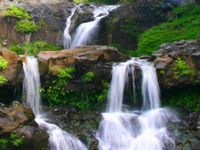 The most famous waterfall you will view on this tour is The Sacred Pools of O'heo, a series of dozens of waterfalls and a natural staircase of pools that flow down to the ocean. In stark contrast to Hana's Rainforest is the impressively massive Mt. Haleakala, the world's largest dormant volcano. 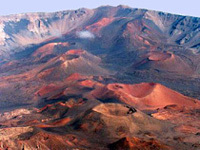 Haleakala (House of the Sun) rises 10,023 ft from the sea and has an immense, moonlike crater. 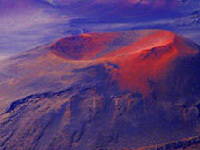 Her landscape is dramatic and while cresting the summit, you see features resembling the moon, including cinder cones towering 1100 ft. The colors of Mt. Haleakala are very dramatic including coppers, ambers and deep burnt reds. Your safety and comfort are of the utmost importance and all of our helicopters and pilots have impeccable safety records. All of our professional Pilots are licensed with a minimum of fifteen years experience. In addition to their flying skills, their knowledge and love of Hawaii is ever present as they share their home with you on this special tour. Please be sure to reserve early as spaces are limited! First and Last Name: A name is required.Please Provide a Name. Email Address: .A valid email is require. Email verification A valid Email Address is required.Invalid Email Address. Thank you for filling out our reservation form, we will contact you ASAP with an availability notice by E Mail. PLEASE NOTE: Due to all the new SPAM FILTER PROGRAMS instituted by all mail agents if a reply is not received in your inbox please check your JUNK MAIL FOLDER FOR OUR REPLY. Problems with this form? Please E-Mail us! 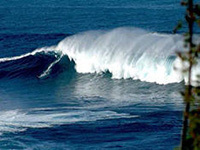 We guarantee a full refund of your excursion deposit if your ship can not make it into the port of Hawaii.